Did you know that Malaysia's fourth Unesco Heritage Site is only two hours drive away from Penang? With our definitive Lenggong Valley Travel Guide, you will discover one of Perak's most interesting, yet lesser-known places, and find all the information you need to hit the ground running. You don’t always need to leave Penang by plane to find great getaways, but did you know that in less than two-hour drive from Penang there’s one of Asia’s most secret Unesco World Heritage Sites? The Lenggong Valley is as unknown as it is pristine and beautiful, and is one of the best places to visit in Perak. The Lenggong Valley’s center is the small town of Lenggong: situated 77km north of Ipoh, it’s a quiet backwater shrouded by jungle that still sees few tourists. Besides eating Lenggong’s prized seafood – particularly the delicious river fish belly – the main reason to come here is to get close and personal with the mysterious Perak Man, Southeast Asia’s oldest, most complete human skeleton. Besides exploring the archaeological heritage of the Lenggong Valley, visitors will find a peaceful place to spend a quiet weekend close to nature and friendly locals, kicking back in a traditional Chinese Kopitiam, and enjoying some seriously appetizing seafood. While you can read more about my visits to Lenggong on BBC Travel, this post aims to be a definitive guide to one of the UNESCO World Heritage Sites of Malaysia that still doesn’t figure on most people’s itineraries. The rich archaeological heritage of the Lenggong Valley spans a staggering 1.83 million years. In 2012 the area around Lenggong was declared the fourth and lesser-known Unesco World Heritage site in Malaysia. If you have an interest in archeology, the Lenggong Valley is a must-visit in North Malaysia: its open-air and cave sites span all periods of human history, from the Palaeolithic to the Neolithic and Bronze Age, up to 1700 years ago. Hand axes found in nearby Bukit Bunuh, the site of a meteorite impact from 1.83 million years ago, are among the oldest found outside of the African continent and suggest that the Lenggong Valley was an extremely early site of hominids’ presence in Southeast Asia. The area also includes a meteorite-landing site at Bukit Bunuh, and Bukit Jawa’s workshop site, where you can see tools dating back to 200,000–100,000 B.P. But the thing that makes Lenggong most famous, and what visitors come to appreciate the most these days, is the system of caves found a few kilometers north of Lenggong town. 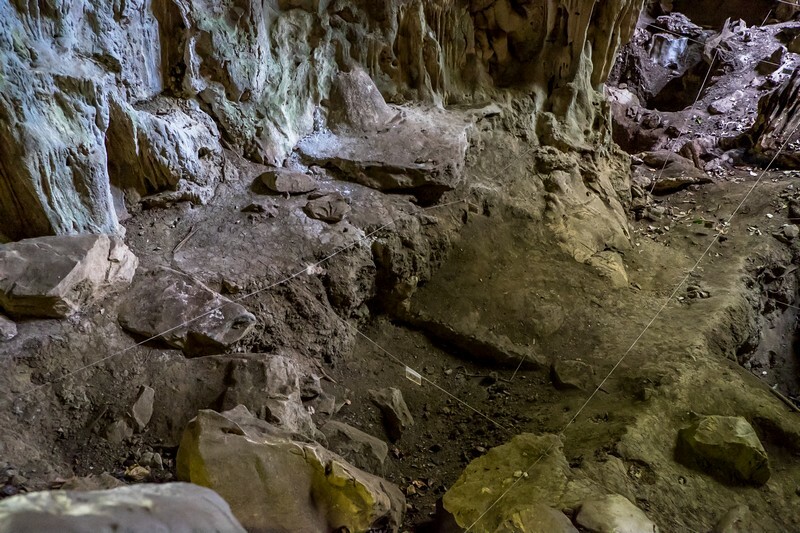 It’s in one of these caves that archaeologists unearthed the mysterious Perak Man, Southeast Asia’s oldest most complete human skeleton. To precise, the human skull found at the Niah Caves in Sarawak is older, and so are the remains of the Java Man. But the Perak Man is by far the best preserved, most entire human skeleton found in the Southeast Asian region. Unfortunately, as of today, all the cave sites are closed to the general public. 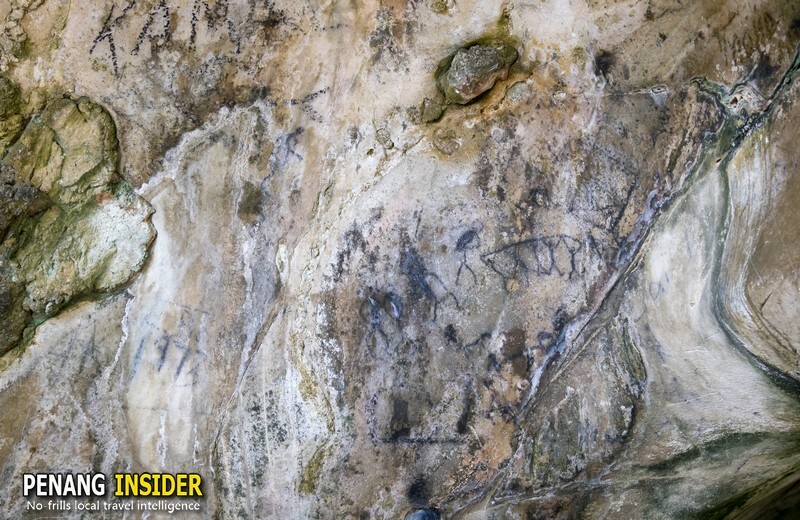 This may sound odd for a Malaysian Unesco World Heritage Site, but many years of poor maintenance have left many of the cave walls defaced by ugly graffiti scribbled by the many local tourists who came here to picnic, hangout, and date. To put an end to this, the caves are now fenced off and guarded. No fear though: they can be accessed by appointment, and free of charge, although giving a tip to the guides is encouraged. All you have to do is contact Mr. Sanjit, the Director of Lenggong Archaeological Museum (daily 9am–6pm; T05 767 9700) in Kota Tampan, 9 km from Lenggong town, and book your visit. On the day of the visit, you have to show up in Lenggong with your own set on wheels, as the guides only have motorbikes. This means that if your group is larger than one or two, you won’t be able to ride pillion with them to the starting point of the short trek to the caves. The Lenggong Archaeological Museum itself is worth visiting for its collection of early stone tools and good information panels describing the history of the Malaysian Peninsula early settlement, supposedly by nomadic tribes that, in the span of centuries, walked all the way from Africa to the Lenggong Valley. It’s also in the museum that you will find the remains of the mysterious Perak Man, Southeast Asia’s oldest most complete human skeleton, neatly arranged behind glass. 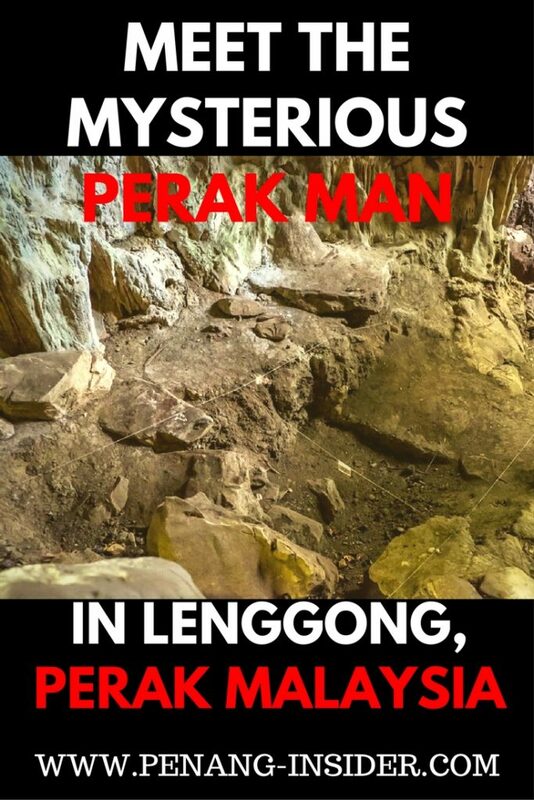 Perak Man was unearthed from an elaborated burial site inside of Gua Gunung Runtuh in 2005. His position — with his legs curled against his chest in a fetal position, and surrounded by hundreds of stone tools and shells — convinced archaeologists from Universiti Sains Malaysia that the Perak Man was revered as an ancient shaman. 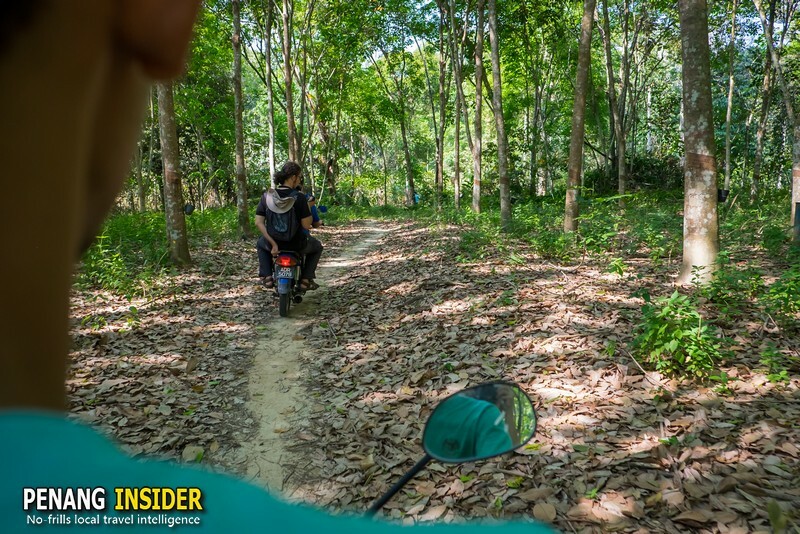 This is also where the guided visit usually starts: once we parked our car in the nearby village, the guides asked us to get on the back of their bikes and we drove for a couple of kilometers into the forest. As we said above, if your group is more than two persons, you won’t be able to ride pillion, and you may have to hike until the base of the cave, which is perched halfway up the side of a hill. 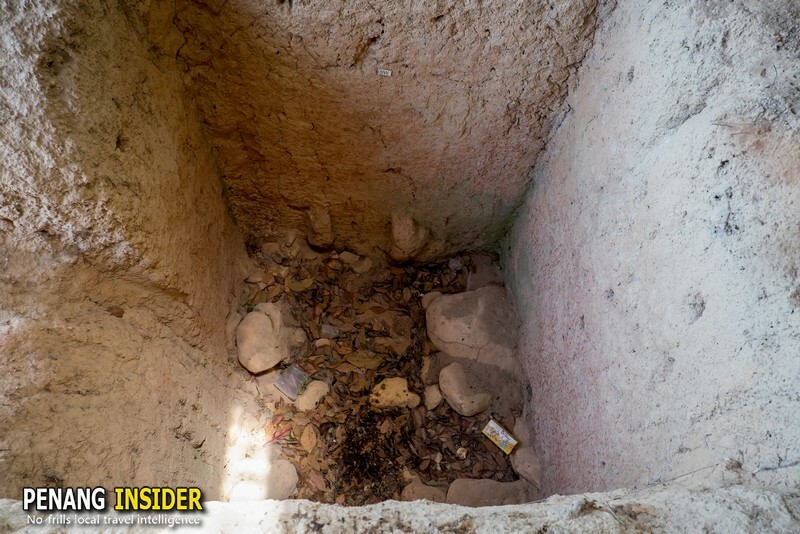 You will have to haul yourself up until the entrance, from where you will see the dig where scientists discovered the remains of the Perak Man. The cave has a modest hall, and essentially all there is to see is the empty burial site. 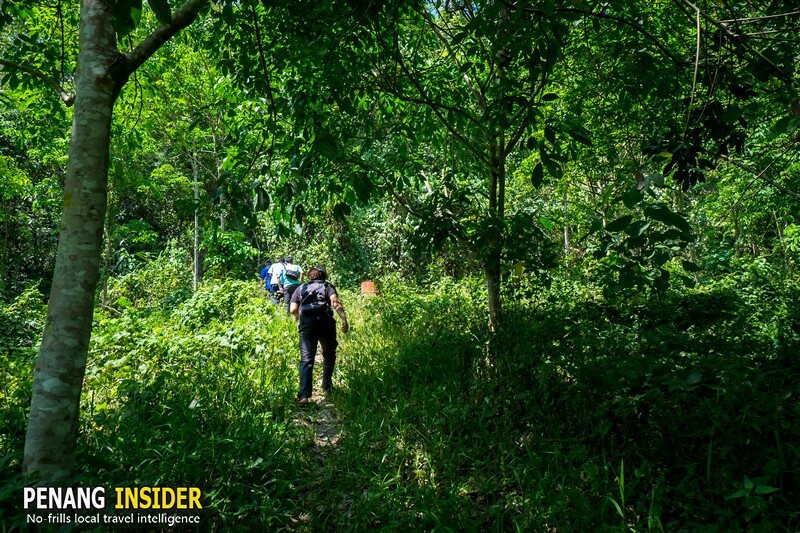 It’s still an exciting hike, and it puts things in perspective if you come here after having visited Lenggong Archaeological Museum and learned about Perak Man’s history. After leaving Gua Gunung Runtuh, the tour continues to the bottom of nearby Gua Badak. The guides will unlock a metallic gate that shelters the wooden boardwalk that will bring you to see four other caves: Gua Badak, Gua Harimau, Gua Puteri and Gua Nggaum. The “rhinoceros cave” is literally not a cave anymore, as it collapsed long ago. What is interesting here is observing some rock art left on the remaining rock face. 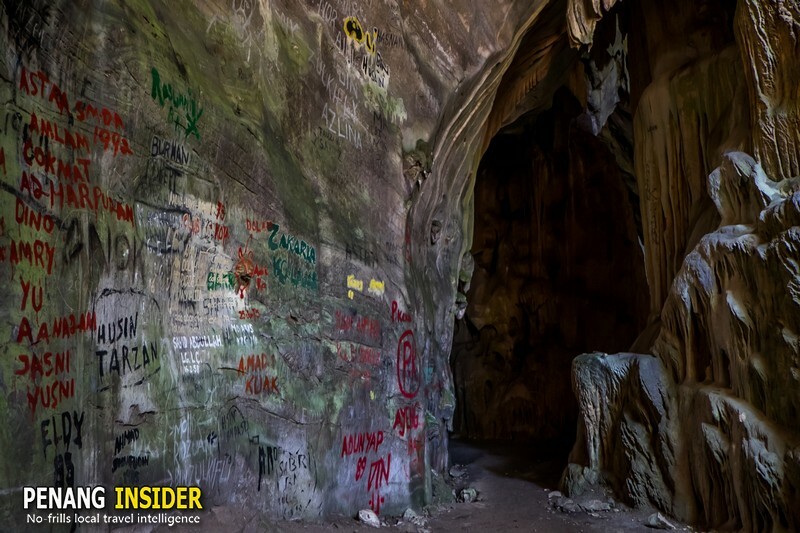 The petroglyph is not the work of the early man, but more recent drawings by the aboriginal orang asli who possibly used this system of caves as a shelter during their nomadic migrations. 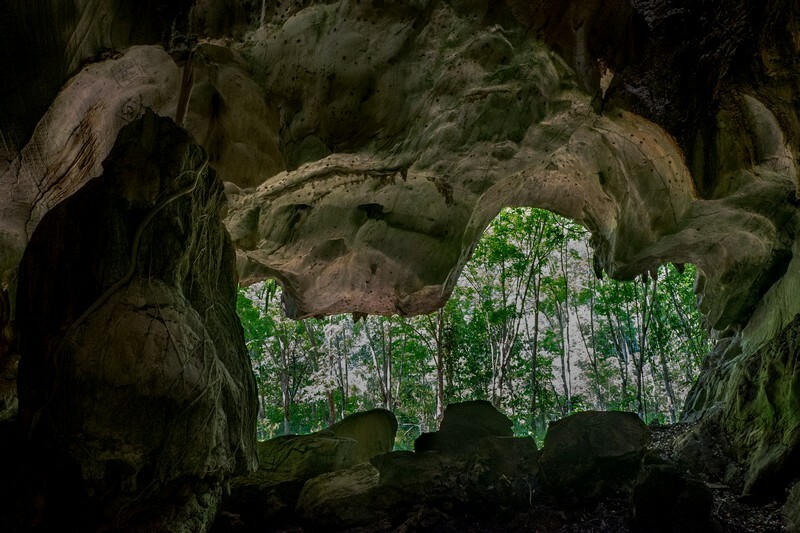 Gua Harimau (”Tiger Cave” in Malay) has this name because legend says a tiger was once spotted resting here. It’s an interesting hollow, with a high entrance and a space that was once used by the early men as a burial or living site. The bones and tools found here have been moved to the Lenggong Valley Archaeological Museum. Gua Ngaum is another small cave that contained tools and bones. It’s a nice hollow, but small, and you won’t spend much time looking around here. Proceeding further, you will find the entrance to Gua Puteri, possibly the most interesting of the Lenggong Valley’s caves after Gua Gunung Runtuh. Even if it doesn’t look like it from the outside, Gua Puteri is huge: it’s a real cave that must be explored with torches to fully enjoy. It contains many rock formations, stalactites, and stalagmites. The centerpiece — and the rock that gives the name to the cave — is a huge rock pillar that resembles the shape of a seated woman. “Puteri”, indeed, means “princess” in Malay. Driving eight kilometers south along Highway 76, the 18-meter high Lata Kekabu waterfall is another worthwhile stop. No ticket is required to enjoy the local insect philharmonic reverberate into this amphitheater of rock, water and jungle vines. Sunset is best seen at Tasik Raban, a shimmering lake nestled a few kilometers further south along the highway. Sitting among chatty locals at hole-in-the-wall Loh Dee’s (Lenggong Main Road, meal for two RM15), is a great local experience. Their bowls of traditional hand pulled and charcoal-cooked wan tan noodles are a local specialty, and can’t be found easily elsewhere. Lenggong’s staple dish—steamed river fish belly— is very good at Restaurant Chat Sook (201 Back Lane West off Main Street; 60–125981733; meal for two from RM30) where is dished up in soy sauce, spicy sambal and bean sprouts. Fastest way: Drive along the North-South Highway from Penang to Kuala Kangsar, exit and follow the directions to Gerik along Interstate 76. You will reach Lenggong from the southern end, passing lake Tasik Raban, a worthwhile stop en route. Most scenic way: Drive from Penang to the Lenggong Valley along quieter backroads, passing through Kulim, and then across a slice of Kedah into Perak proper via Selama. This stretch is great to ride by motorbike. By Public Transport: Catch a bus to Kuala Kangsar (every 20 min; 1hr 15min) from George Town or Ipoh’s Medan Kidd station and connect to the frequent local buses to Lenggong. Lenggong town, a jungle settlement nestled below a ridge of viridian hills that formed after an ancestral meteorite impacted the Lenggong Valley (image credit: Kit Yeng Chan). The choice of accommodation in the Lenggong Valley is not much. There is a government run resthouse, but that’s not what we’d like to recommend. Soon Lee Hotel (31 Jln Besar, T 014 327 6204; doubles RM50) has simple rooms in the heart of town, and amiable owners Mr. Ng and Pinky Mok can help with picking up transport in Lenggong. Permaculture Farmstay (room for two including meals and workshops RM290) is possibly the best Perak agrotourism resort, set on the hills surrounding Lenggong. Czech owner Ladia picks up guest from the town’s center and takes them to his eco-resort by 4-wheel-drive. The tariff includes food and other activities such as jungle trekking to a nearby waterfall with its natural swimming pool. If you have experience, you may also enroll in the volunteering programme and help Ladia and his Malaysian wife to take care of their garden. Alternatively, there is a wider selection of hotels and resorts in the nearby towns of Taiping and Kuala Kangsar, both in about an hour drive from Lenggong. FOUND ME USEFUL? PIN ME FOR LATER, THANKS!